Happy Mother's Day! I hope that all the lovely mothers out there are having a wonderful day. Many celebrate Mother's Day with cards, flowers, gifts, and taking their mother to her favorite restaurant, making this holiday a time of great celebration . . . and some well-deserved relaxation! But for most of us, our mothers mean much more to us than all the above can possibly express. Once this day is over, Mother's Day the holiday will come again next year. But whether our mothers are here or no longer with us, I feel that every day of our lives should also be Mother's Day. If it weren't for our parents, and especially our mothers, none of us would be here (or have survived our foolishness, from the toddler years on up!). Therefore, I wanted to express my thanks and share thoughts about the importance of our parents, from a Buddhist perspective. The following is a short excerpt from the "Sutra about the Deep Kindness of Parents and the Difficulty of Repaying it"*, also known as the Filial Piety Sutra*, in which the Buddha instructs Ananda and attending monks of the kindnesses of a mother. "There are ten types of kindnesses bestowed by the mother on the child. 1. The kindness of providing protection and care while the child is in the womb. 2. The kindness of bearing suffering during the birth. 3. The kindness of forgetting all the pain once the child has been born. 4. The kindness of eating the bitter herself and saving the sweet for the child. 5. The kindness of moving the child to a dry place and lying in the wet herself. 6. The kindness of suckling the child at her breast and nourishing and bringing up the child. 7. The kindness of washing away the unclean. 8. The kindness of always thinking of the child when it has travelled far. 9. The kindness of deep care and devotion. 10. The kindness of ultimate pity and sympathy." The sutra elaborates on these kindnesses, and also how the heedlessness of children hurts their parents. Ananda and the monks are deeply moved by what the Buddha tells them, and in considering the hardships faced by parents, are brought to weeping. They ask what they can possibly do to repay their parents for their kind deeds, and the Buddha tells them to recite the sutra, hold the precept of pure eating, cultivate blessings, and repent offenses on their behalf. In many ways, reading this sutra made me feel both awe and sadness. I may have felt the same way Ananda did, remembering the many great kindnesses of my parents, and also thinking about how I must have troubled them in so many ways. I am amazed that neither of them have seemed to mind, and even laugh about my past heedless behavior (perhaps after a few years had passed, of course :). So again, to all the moms out there- Have a very Happy Mother's Day- today and every day! And to my Mom: A lotus for you, representing the beauty of yourself, and all the wonderful things you have done for me. To my Mom and Dad: Mama und Papa, Ich liebe euch sehr, und hoffe das ihr beide wissen wie viel das ist! Story of how a mother's touch saves her newborn infant's life. 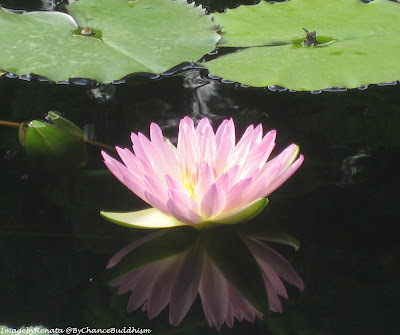 The image above was taken by me in 2009 at the lotus ponds in the Chicago Botanic Gardens, located in Glencoe, IL. Enjoy- May all beings be happy! * I have read that this sutra may not actually recount events during the Buddha's lifetime, but is instead a 7th century Chinese Buddhist answer to Confucian criticism that Buddhism places monastic life over filial piety. However, not much additional information is available. If anyone knows the historical context of this sutra I would be happy to learn more (I had wondered why in this text the Buddha asked the monks to 'print' the sutra, since sutras during the Buddha's time were transmitted orally). As always, I look forward to your comments, and would love to hear about your Mother's Day celebrations and memories. Happy Mother's Day! Hello quietmind279, thanks so much for your kind comment. I am glad you enjoyed the excerpt from the sutra I shared. Beautiful, isn't it? Thanks for your kindness and wisdom!